Fremont, CA, May 20, 2008 – Corsair® www.corsair.com, a worldwide leader in high performance computer and flash memory products, announced today that Corsair Labs has set the world record for the highest achieved DDR3 frequency. 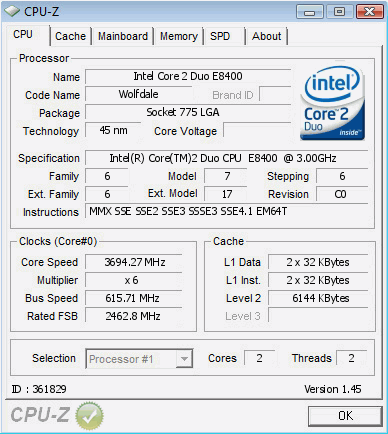 Verified and validated by CPU-Z, Corsair Labs achieved an astounding speed of 2462MHz at CL=9 with a single-rank 1GB module. This new world record eclipses all previous CPU-Z validated memory benchmarks. This record was set using Corsair’s award winning DOMINATOR DDR3 memory module paired with an Asus P5E3 Premium motherboard based on the Intel X48 chipset. This is now the highest achieved DDR3 frequency of all time. Validated results and setup details can be found at http://valid.x86-secret.com/show_oc.php?id=361829. The DOMINATOR family of memory represents the ultimate in performance technology engineering from Corsair. DOMINATOR is designed with the highest performing IC over-clocking capability and Corsair’s patented DHX cooling. DHX technology is an innovative quad-layer heat sink design that optimizes memory performance and reliability by maximizing thermal dissipation. With DHX Technology, heat is removed via two paths – the leads of the BGA chips into the PCB (convective cooling) and the back of the BGA packages into the custom designed extruded aluminum heat sinks (conductive cooling). This allows DOMINATOR modules to achieve outstanding overclocking performance while remaining stable and reliable. Corsair’s award winning DOMINATOR memory is widely available from Corsair retailers and etailers. Corsair memory products are backed by a lifetime warranty. Complete customer support via telephone, email, forum and the TSXpress helpdesk are also available. For more information, see www.corsair.com. I like how the CPU Core Voltage box is blanked out. And no mention of RAM voltages used, or even stability... sounds like a suicide run and no stability? How very useful. 600+ FSB is never a small OC IMO. Would be very curious to see what the CPU and FSB voltages were for their overclock, besides just the RAM voltage. Last edited by Kougar : 21st May 2008 at 17:24.